In this 5 page download is a directions sheet, two different recording sheets, and two pages of vocabulary words and cards. Laminate the words and cards and use as a center or small group activity. Students will match the words with the definitions after reading "Chrysanthemum" by Kevin Henkes. 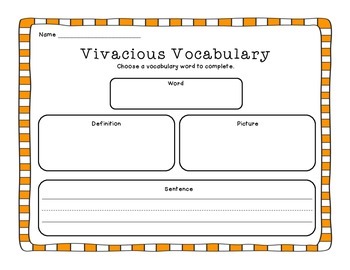 The recording sheet includes spaces for the word, definition, picture and a sentence. 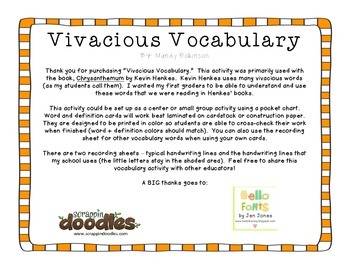 This activity can also be used with other vocabulary words and lessons.